The latest game based on the hit animated franchise now creeping into its fifth decade, Scooby-Doo! 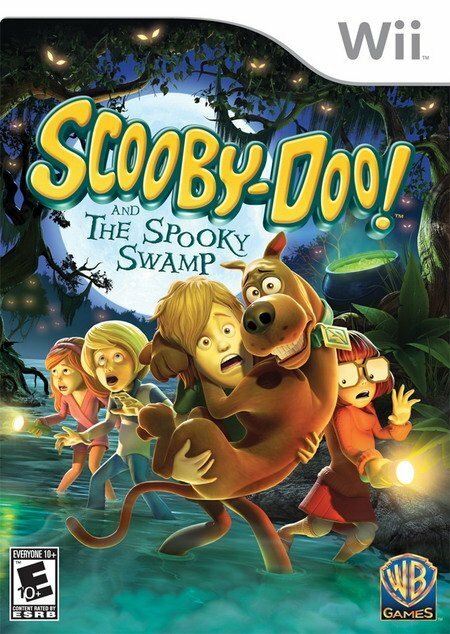 and the Spooky Swamp, is a platformer that should feel familiar to fans – as a licensed game, it taps into the huge built-in audience of the show that has, over the years, demonstrated a very high tolerance for unapologetically cheesy stories. But will fans of the show enjoy the game? The first thing you will notice about Scooby-Doo! and the Spooky Swamp are the cartoonish graphics. The engine is the same as used in the previous game, Scooby-Doo! First Frights and will be instantly recognisable to anyone who played that title. The art style goes hand-in-hand with the gameplay, which follows the lead of a lot of kid-oriented tie-in games and plays like a cross between a platformer and beat-em-up, similar to the LEGO series. The art style looks very good as well, and is stylistically consistent with Scooby-Doo cartoons. The usual gang is here; Fred, Daphne, Velma, Shaggy and Scooby are all playable characters. As in its predecessor, they're animated to look younger than they did in the classic series – too young to drive the Mystery Machine, one would think, but luckily you'll be on foot most of the time. As before, it's designed to relate to a younger audience as opposed to the older fans. You play as your choice of one of the characters (the availability of each varies depending on the level) and a friend may join in for simultaneous co-op as another. 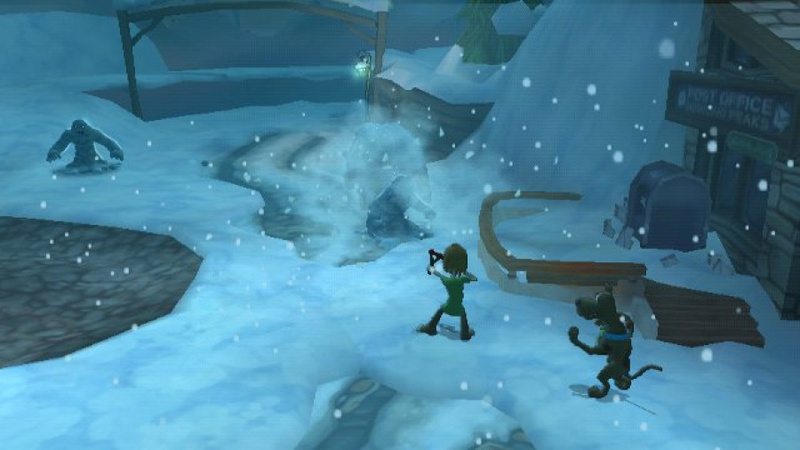 For instance, you begin the game playing as Shaggy or Scooby, and you may freely swap between them at any time. As you play, other characters will become available when the story introduces them. Just as the engine is reused from First Frights, so too are the gameplay mechanics. 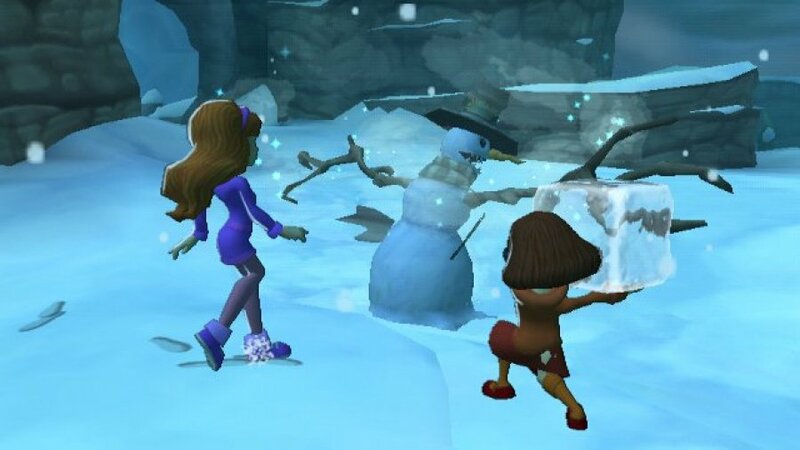 Like before, swapping characters is an integral part of the experience as each one has unique abilities that offer different puzzle solving techniques. For instance, Scooby can fit into small doors, Fred can move heavy objects, and Daphne is skilled at climbing poles. Each character uses these to help you progress through each level and find hidden items. In a few cases there are more than one possible way to get from point A to point B, but the vast majority of the time, the game forces you along one path. As such, the challenge is figuring out the path and selecting the correct character that can make it happen. You'll always have the right characters available at any one time to solve the very simplistic puzzles presented, and figuring out what to do at any point is usually pretty straightforward. Need to get onto a roof? Maybe Fred can move a big box and jump up there. Again, the game is targeted towards a younger audience, so the challenge level is low. In addition to puzzle-solving, each character has his or her own fighting style varying between physical attacks and ranged attacks. Each has its own advantages and disadvantages, and some work better against certain enemies than others. Bad guys are generally dumb and zombie-like (many of them actually are zombies) and simply generate seemingly at random and walk towards you. For the most part then, this is a choice based on personal preference and, for combat purposes, players can choose whichever one they enjoy the most every time. 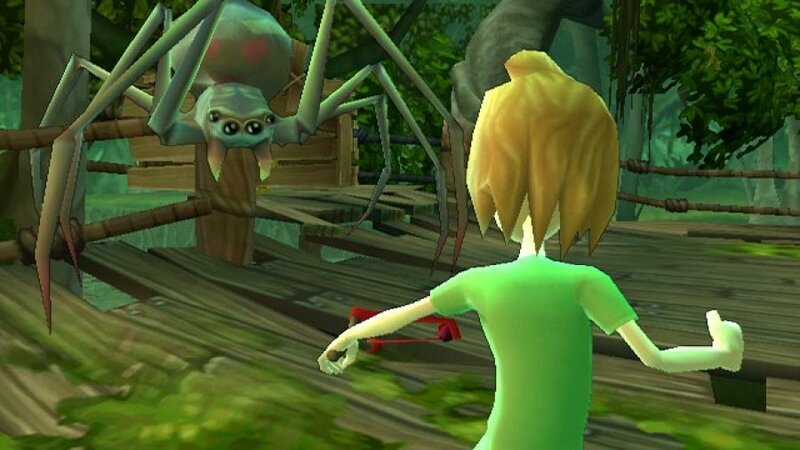 A telling example of the lack of challenge can be found near the start of the game when, as a tutorial, Scooby and Shaggy are challenged to fight a horde of giant spiders for as long as they can to get practise at combat. The game apparently expects you to wear out and die after being overwhelmed by dozens of enemies at once. However, you can stand in a corner with your back to the wall and hold them off seemingly indefinitely. After about ten minutes of this we gave up on purpose as it did not look like we were ever going to lose, except possibly to repetitive stress injury from hitting the B button too many times. Even so, the story presented will please fans of the show as it stays pretty true to the ludicrous plot lines traditional to the series. As the title implies, it follows spooky, supernatural themes across multiple chapters. Don't hold them to that “Swamp” part of the title, though, as you'll spend only part of your time here and soon find yourself roaming around the deserts of the American Southwest once you get past the preliminary introductions. Along the way you will find hidden objects such as Scooby Snacks, sandwich parts and other collectibles that you can generally spend to purchase alternate costumes. These merely change the appearance of each character and are not a factor in gameplay. Unlocking all of them, however, as well as finding everything there is to be found including sandwich parts to make the largest sandwich, can provide an added challenge. 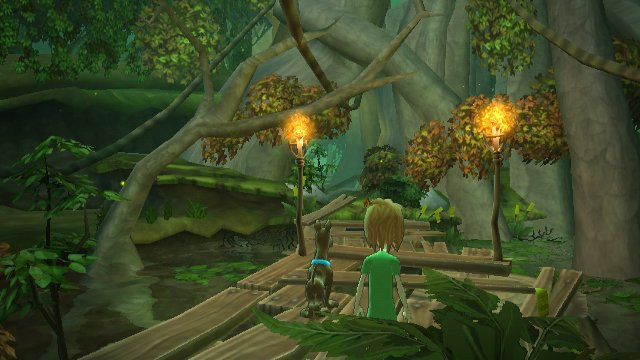 For a game intended for a younger audience, the quality of entertainment in Scooby-Doo! and the Spooky Swamp is pretty high, as most of what was good about its predecessor, Scooby-Doo! First Frights returns here. Although it's probably too easy for experienced players, the skill level is about right for those with less gaming experience, though younger fans may still need someone older to play along with them to help. As the game is also relatively short (even shorter than First Frights) and broken into smaller episodes, it should be fun for at least one playthrough for short attention spans both young and old. Wow, I was expecting a 4 or so. Her name is Velma, Wilma is from the Flinstones. @#3 ya i was about to point that out. Velma error fixed! Sorry folks, thanks for pointing it out. Well... I wasn't expecting a 7... especially for a game that's a tie-in with a TV show. And you reviewers need to brush up on your kid TV knowledge, haha. My kids enjoyed the first one. Basically a Lego game, but without the legos. Like, wow, a decent licensed game... Zoinks! Jenkies! Those medling kids actually have a good game! In one of the pictures, Shaggy or whatever his name is, looks like a woman. I was expecting a rating below 3 because a friend of mine has this for his kids, they beat it in an hour and guess how old they were, FIVE!!! This was their first game too. @Wildvine53: You mean this wasn't the Flintstones? Well heck, now I have to change the whole review! Yes Gabbo unacceptable! I was going to buy the game until I saw that. Ruined my day! okay, a bit embarrassing of a question based on how easy this game is for most...but when i have velma try to go through the portal to covington's I continually get refused- any suggestions?